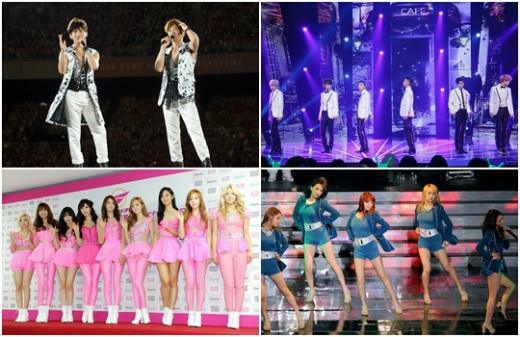 53 Korean idol groups, including TVXQ and Girls’ Generation, have been nominated for the Hallyu 10th Anniversary Japanese Music Awards, which will be held in Chiba, Japan in October. According to Oricon, a ‘Hallyu 10th Anniversary Awards’ awards ceremony will take place at the International Convention Hall in Chiba, Japan on the 9th of October to celebrate the 10th anniversary of the Hallyu Wave. The committee in charge of the awards ceremony will hold a poll from the 22nd till the 30th of September for boy bands, girl groups, and female and male solo artistes, to choose the top 5 groups in each category. The nominees for the boy band category came to a total of 33 teams including INFINITE, AJAX, EXO, Epic High, FT Island, MBLAQ, CN BLUE, JYJ, SHINee, SHU-I, SHinhwa, Super Junior, ZE:A, Choshinsung, TEEN TOP, 2AM, 2PM, TVXQ, NU’EST, B.A.P, B2ST, B1A4, Big Bang, VIXX, Boyfriend and U-Kiss. The girl group category had a total of 20 nominees including Jewelry, After school, A Pink, f(x), Girls Day, KARA, SECRET, SISTAR, Girls’ Generation, Davichi, Dalshabet, T-ara, 2NE1, 4Minute, Brown Eyed Girls, Miss A, Rainbow, and the Wondergirls. The male solo category includes Psy, Se7en, Rain and Kim Bum Soo while the female solo category includes IU, Gummy, Ailee, BoA and Wax.